Recipe that you have always wanted to make but have yet to attempt: Homemade seitan... I'll attempt it soon! 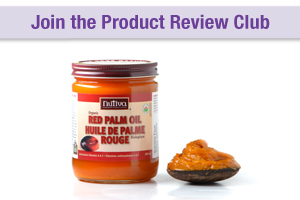 Thank you for the opportunity to review this product. I found it at Loblaws with no problem. I tried the pineapple/banana flavour. 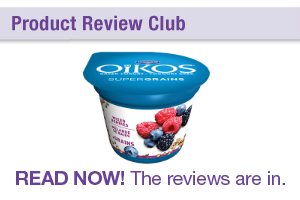 I really liked the yogurt (I love Greek yogurt and the extra protein it has compared to regular yogurt), the flavour was really nice. I was a bit disappointed in the amount of seeds in it though - I thought there would be more! The sugar content is a little high too and I think it could still taste great with less sugar added. I would recommend purchasing plain greek yogurt and to add your own seeds and fruit, to help lower the sugar content and to be more cost effective. I might add a bit more seeds to it as well (but keep in mind the extra calories this may give!). I do think it can be a great snack though as it is high in protein and kept me feeling satisfied for a few hours (and it tastes great!!!). I am going to give it a 3/5 for the sugar content and higher cost. Thank you for the opportunity to try Truvia! I decided to add it to my coffee, which I normally drink with just milk added. I found the Truvia to be too sweet to my taste, so I think I would add less next time. It is definitely more sweet than sugar. I don't think I would use it in coffee again, but maybe in another product! I think the product would be good for anyone looking for a sugar substitute if they enjoy the taste, but I would be careful with using too much as the main ingredient is a sugar alcohol (which could cause GI upset). Overall, I would recommend Truvia for someone looking to reduce sugar intake, but I would use it in very small amounts. Thank you for the opportunity to review Nutiva organic chia seeds. This has not been my first time using chia seeds, but I haven't had them from Nutiva before. The Nutiva chia seeds are similar to other chia seeds I have used in the past. I used the chia seeds as a topping to my morning oatmeal and I made coconut chia seed pudding. The seeds do not have much of a taste at all. They provide interesting texture to foods (as they absorb a lot of water). Some people may not enjoy the texture of the seeds (they can be a bit slimy) but I think they are great. The chia seed pudding is also very filling which makes it a great snack. I will continue to use them in my kitchen. From a nutritional standpoint, chia seeds also offer a good amount of fibre and omega-3's for a small amount of seeds, and the seeds do not need to be ground in order to absorb the omega-3's. This can be great for anyone wanting to increase their fibre intake or who may not get omega-3's from other sources. Definitely 5/5 stars from me for this product!